George James Hoskins was a boat builder at Ballast Quay from the mid-1820s onwards. His name appears in the East Greenwich rate books in 1825, paying “£10 per quarter for house and shop”. The shop was probably his workshop, which would have been near or on the foreshore. After this entry there are no further details in the rate books but there are numerous inclusions in the local trade directories, namely Pigot’s and Kelly’s, between 1827 and 1852, describing George as a boat and barge builder at Crowley’s Wharf, Ballast Quay and Union Wharf. 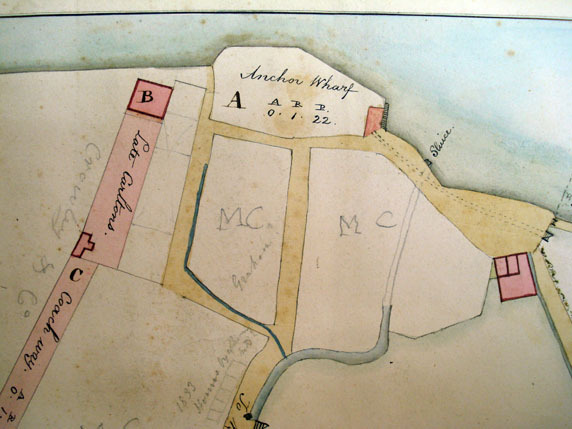 The Hoskins family had an earlier connection with Ballast Quay during the 18th century. George’s uncle, Samuel Hoskins had undertaken an apprenticeship in 1760 with an established shipwright at the Quay called Samuel Tarry (surname sometimes transcribed as Terry). Tarry is mentioned in Morden College records as working for HM Customs, building and repairing yachts and boats. Samuel Tarry is recorded in the East Greenwich rate books paying rent for "a house and shop"on Ballast Quay from 1775 onwards. 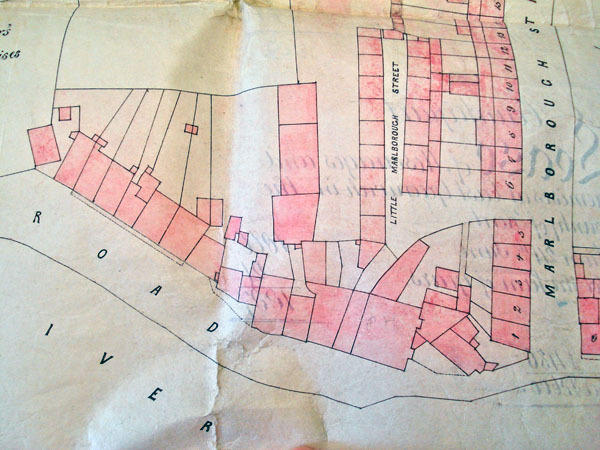 Samuel Hoskins stayed with Tarry for 26 years, but then moved to Wood Wharf in West Greenwich and started his own boat building business with two of his sons. Within three years he was already quite successful, as the rate books for West Greenwich in 1789 show that he was paying rates on a "house, shop, sheds, wharf and dock at Wood Wharf". Samuel was joined in this enterprise by his younger brother, Workman Hoskins, who had gained his boat building qualification in the Navy. Workman was to become the father of George James Hoskins, who was born in 1799. George James Hoskins learned his boat building skills from his father. When he was in his early twenties, George married and moved from Wood Wharf to Ballast Quay. He and his wife Sarah Alice had seven children at Ballast Quay and buried two of them from there as well. The death certificate of one of their little boys reports that he had died of “diseased bowels”, a possible consequence of living close to the open sewer which ran at the back of the Quay. In 1840 the Hoskins family rented rooms at Thames Cottage, a large property on Ballast Quay leased by William Bracegirdle from Morden College which he also sublet to other families. George Hoskins had a boat building business for 29 years on Ballast Quay. The History Gazetteer and Directory of Kent - Bagshaw - Volume 1 of 1847 lists "George Hoskins, Boat and Barge Builder East Pier", and "Wm Geo Girdle, (missing the Brace! ), Fishing Smack Owner, East Pier". Sadly George Hoskins business folded when William Bracegirdle was forced to surrender his lease on Thames Cottage in 1849 owing to his insolvency. Bracegirdle's financial problems resulted from the costs incurred in the court case he fought and lost against the Parish of Greenwich for repeated trespass on his Wharf at Ballast Quay. His difficulties were further compounded by the expense of building the East Greenwich Steamboat Pier, mentioned above. Thames Cottage, together with its boat building and sail making premises, was demolished in 1854. Sadly, George and Sarah, with no further income, inevitably ended their days in the Greenwich Union Workhouse. However, their eldest son, also named George James Hoskins, became a third generation master boat builder and carried on working in the area, living at Chester Street (now Banning Street). His descendants moved away from the area during the Second World War to Worthing, West Sussex, where his great-great grandson, Albert William (Bill) Hoskins, still lives today. The father, George James Hoskins, had a brother, Thomas, who lived mostly at Little Marlborough Street, which was reached through a lane off Marlborough Street (modern Lassell Street) at Ballast Quay, behind the Union Tavern, or Cutty Sark, as it now is. In 1825, when a third child was born to Thomas and his wife Mary, their address was given in the parish register as Crowley's Wharf and his occupation as waterman. Thomas Hoskins is also listed as a boat builder in Pigot’s Directories in 1826 and 1827, perhaps because he was helping out in the Hoskins’ business. He and his wife had another baby in 1845 at Little Marlborough Street and in the same year Thomas disappeared without trace. 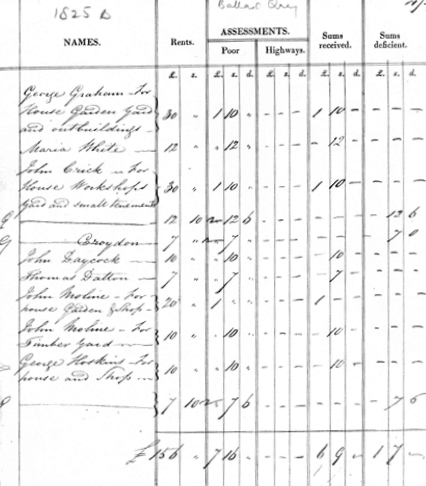 On the 1851 census his wife stated that she was a widow. I believe he may have drowned - most watermen couldn't swim and there are many unidentified persons at the end of every quarter in the Greenwich death indexes. My maiden name was Hoskins and I am descended from Workman Hoskins, his sons, and from his brother George James Hoskins senior, my 3x great uncle, and from Thomas Hoskins, my 3x great grandfather, who were all boat builders at Ballast Quay. Today, near Ballast Quay, there remains in the name Hoskins Street a vestige of the memory of the Hoskins family who lived and worked in the area. This road used to be known as Bennett Street in the 19th century. Now an index card at Greenwich Heritage Centre states that it is, “named after Hoskins the Boat Builders”.